Here is a breakdown of our spending in a few handy images. 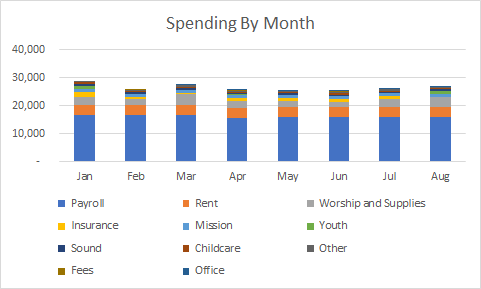 These aren’t meant to convey everything Intowners might need or want to know about our budget and spending but are meant to be a snapshot that will provide some data points that we’ve referred to in our congregational meetings and previous emails. These charts are pretty self-explanatory but if you have questions please let me know at brian@intownchurch.com. Note: “mission” is our financial support of the Carlson’s in China, The Janssens’s in Taiwan, and the Penkoff’s in Cameroon.